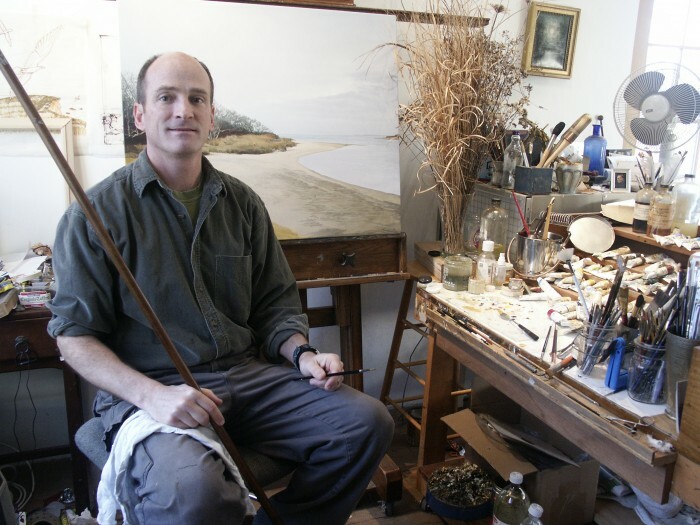 Andrew Gordon Moore has a studio in Harthaven, Oak Bluffs, on the Massachusetts island of Martha’s Vineyard. He is a realist painter, working in watercolor, egg tempera and oil. As a hunter, fisherman, sailor, and self-taught naturalist, the world outdoors is his source. Andrew’s work reveals this deep involvement in and appreciation of island subjects studied through every season. Occasionally, the artist journeys to coastal Maine and other locations adding these images to his predominantly Martha’s Vineyard-based work. While Andrew Moore encounters the subjects of his paintings during excursions on the sea and in the field, he paints the final work in a controlled, slowly-layered manner in the studio. Here, he surrounds himself with objects from the field – rocks, grass, dried plants, fish, birds – and numerous drawings and photo- graphs. Andrew then builds the idea from a small sketch into the intricate final painting, blending studied detail into a strong composition of color, tone, pattern and form.